The first time I put an egg on the island, it rolled off. Splat. I thought “huh” and that was that. After this started happening frequently, I started to wonder if something wrong with the island. And then my favorite rolling pin fell off and broke. Not sure if I didn’t trust my instincts or if I just didn’t want to deal with a potentially major repair issue, but I didn’t do anything about it until a month later, when I was sitting on the couch, looking back at the kitchen and thought the island looked like it was tilting slightly to the right. My husband got out a level to confirm it was slanted (off by a little less than a quarter inch) before we called Tim, our Project Manager on the remodel (and Tim, if you think you’ve gotten out of an interview, think again!). It was a relatively easy fix (well, I don’t know how easy it actually was, but it didn’t take Tim and Marty, the carpenter, long to fix it). 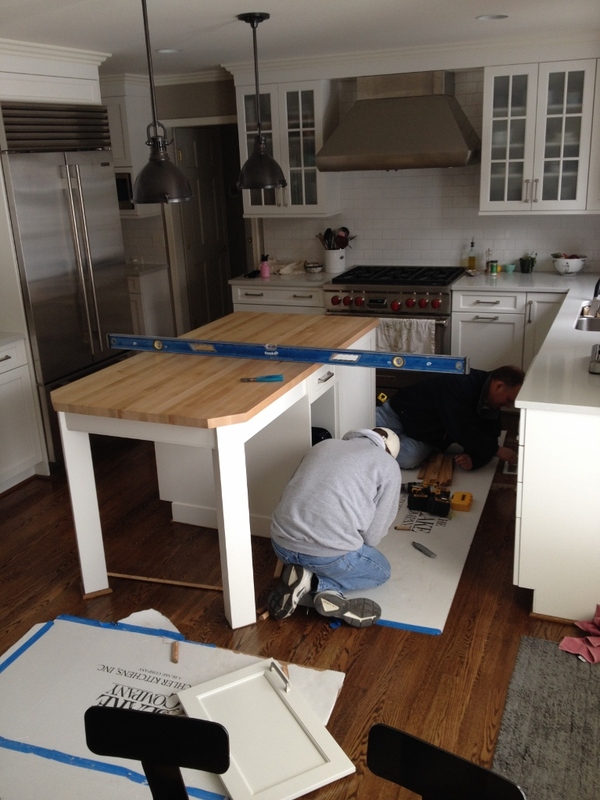 They were able to raise the island and put a shim in it, which was covered up by the toe-kick. It’s all good now; no more runaway eggs. This entry was posted in Other and tagged Home Improvement, Home Reno, Home Renovation, Kitchen Design, Kitchen Island, Kitchen Remodel. Bookmark the permalink. Super easy fix, sorry about that roller.